Terror of the Deep Shark Glass. Just when you thought it was safe to take a drink of water there is a shark coming at you. This is the dreaded "drink shark." It comes after you through milk, soft drinks, and even your Bloody Mary. You can hear the music in the back of your mind -- da dum . . . da dum . . . da dum, da dum, da dum. Fortunately it is just a 12 ounce glass with a molded shark inside of it. Flip it over and you have a 4 ounce "Shark Shot" for mixed drinks. That's a little bigger than a double shot, so be careful. 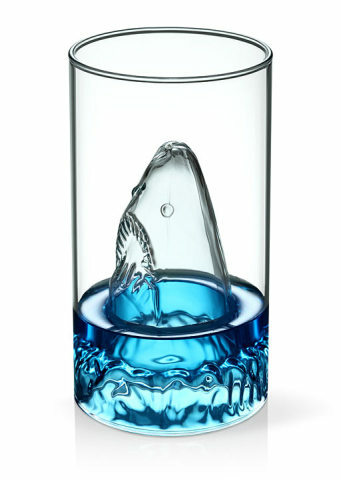 The glass and shark are dishwasher and microwave safe for easy cleaning. If this shark actually tries to bite you then you may need a bigger glass. 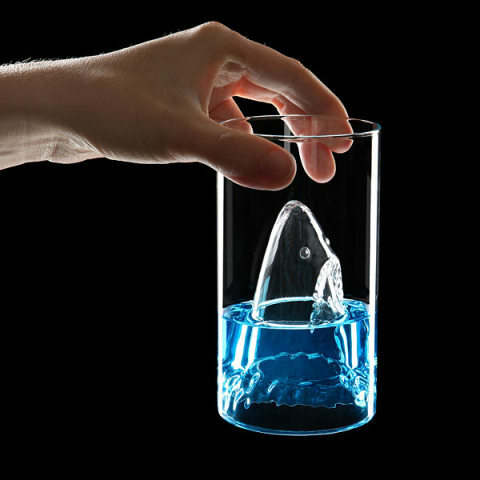 To order your own Terror of the Deep Shark Glass, click here.